Ordering custom crystal awards from Bennett Awards is an easy, affordable way to create an award that is ideally matched to your recipient or event. There are many choices, so this blog post will help you navigate some of the options you have at your disposal. When you order your custom crystal awards from Bennett Awards you are getting a one-of-a-kind award at the best pricing, quickest production time and best customer service available in the business. We have many shapes and sizes to choose from, enabling you to hit your target budget and/or to create different award levels for your recipients. · 8-10 day production time after art approval for crystal awards with Deep Surface Etching and/or Digital Color Printing (see below for explanation). · 7-10 day production time after art approval for crystal awards with 3D Subsurface Engraving (see below for explanation). Personalization: Free on most new crystal award orders. Copy changes are free on all repeat orders. Personalizations are typically the award titles and winner’s names that usually change on each award where the overall layout, artwork and fonts usually stay the same to maintain continuity. Minimum order amount for new customers is $300 + shipping. Each crystal award includes 1 decoration method free of charge. Each additional method added incurs an additional fee of $14 per award. e strive for the best quality in the industry, which is why every award is hand-etched. Our glass artisans ensure that the etching is done at the optimal depth and consistently captures the detail of your artwork. We use a sand-blasting process which is far superior to other etching processes. Deep Surface Etchings can be done on any exterior surface of the crystal award. These are most commonly etched on the face or front surface of the award, but we love to get creative so let us know your ideas! Colorfill is used to enhance the imprint on an crystal award or plaque. Colorfill is available in a variety of translucent and opaque colors. Translucent colorfill allows light to pass through and can be applied to both optical crystal and colored crystal. Choose from 11 different colors. Opaque colorfill does not let light pass through it and can be applied to optical crystal, colored crystal, and black glass. Choose from 5 different colors. Since the Colorfill counts as an additional decoration method, add $14 per piece per color. Multiple/complex designs, requiring additional labor and art modifications, will be subject to extra charges. 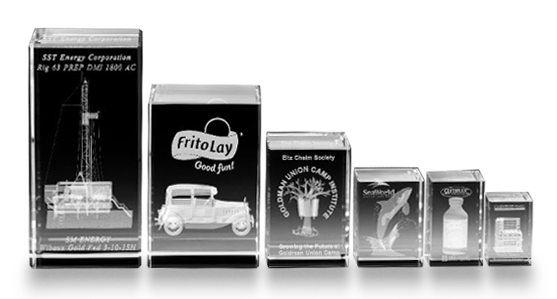 We use state-of-the-art technology that can recreate any image inside your crystal awards. A high-tech laser makes minute fractures inside the crystal, producing a 2D or 3D image that suspended inside the award. Our proprietary process produces clear, spectacular images. No image is too big, too small, or too intricate for our Subsurface Engraving technology. Our Full Color Digital Printing process allows you to embellish certain awards and plaques with a burst of color. Any 4-color image may be transferred to a crystal award. Images appear multi-dimensional and vibrant, with plenty of space for personalization. With our digital-plus process, you can add a second imprint to the back of your imprint as a personalized sentiment to your recipient. Supported file formats: Adobe CC, Corel Draw files must be exported as .AI files. Art must be saved as vector line art. Art charges may be incurred if we are required to search for matching fonts. Attach names of all fonts used in the art file in the email or on a cover sheet, Save as an .EPS, .AI, or .PDF file. Bold, open, sans serif fonts work best for deep etching. Avoid small script fonts. If a font is not etchable, we will substitute our closest etchable font. Free art services when the followed accepted formats are provided and approved: .AI, .EPS, .PDF, .JPEG, .GIF, .TIFF, .PNG, and .BMP. Minimum resolution required is 300 dpi. Free 3D modeling when #DS Max (.Max) files are provided and approved: Formats accepted: .OBJ, .IGS, .STL, .DAE, .FBX, .SKP, .DWG, .STP, .DXF, and .3DM. Submit high-quality color photos and digital images. Exact color matches cannot be guaranteed, Minimum 300 dpi at the size of the imprint area. Image change fee: $16.00 when a new image is used on each individual award. Add $14 for each additional imprint added to an award. We always provide you with an artwork proof for your review and approval prior to production of the award to ensure the awards are exactly what you are want. Rush charges may apply when the ship date is five or less working days from receipt of the order and artwork. Rush charges are 10% of the order or a minimum of $60.00, whichever is greater. All awards and gifts come in a master carton. The carton includes an individual black gift box holding your awards. Strict quality control standards are maintained on all awards. Slight differences in size due to hand-finishing and polishing are not considered defects. Minor variations in materials may result in variances in appearance and are considered to be within industry standards and not defective. Placing your order is easy! Just email us back with what you would like to do and we will take it from there and help you every step of the way!